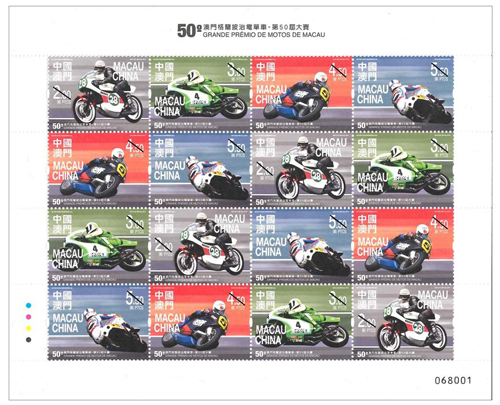 Stamp Issue "50th Macao Motorcycle Grand Prix"
The Macao Motorcycle Grand Prix was first run in 1967, it has become one of the world’s most prestigious motorcycle road races, the international field made up of the best road and endurance riders on the planet do battle between the iron Armco barriers and unforgiving walls of the Guia street circuit at breathtaking speeds nudging 280kph. 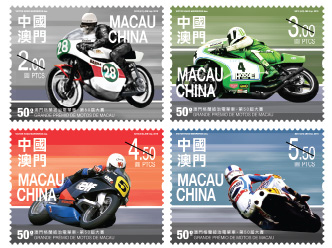 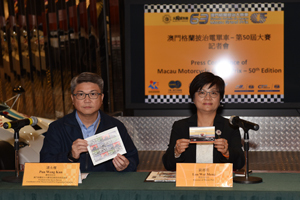 This year is running to the Golden Jubilee, to celebrate and promote this great international event, Macao Post will issue the stamp theme “50th Macao Motorcycle Grand Prix” on 18th November, 2016. 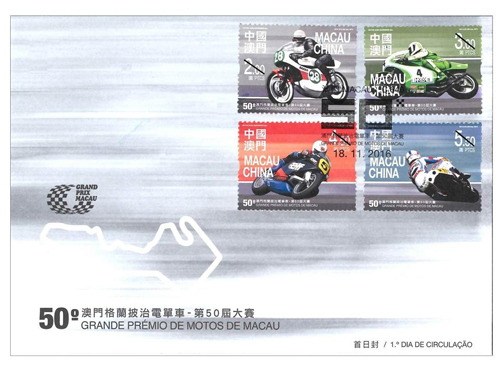 This issue includes a set of four stamps and one souvenir sheet, through the Macao stamps by promoting this annual great event to every corner of the world. 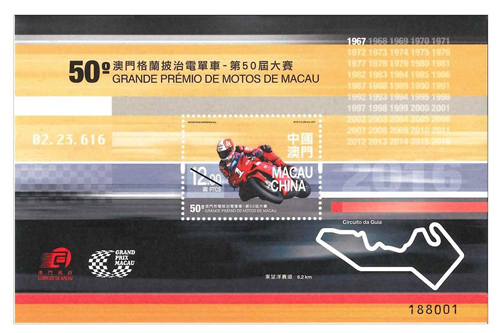 The stamp designer of this issue is Mr. Victor Hugo Marreiros, and the text of the information brochure is written by the Sports Bureau of Macao Special Administrative Region Government. 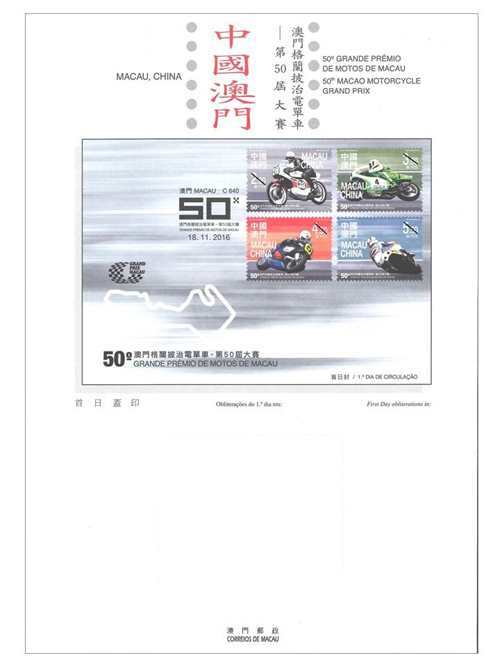 This is the fourteenth theme in 2016. 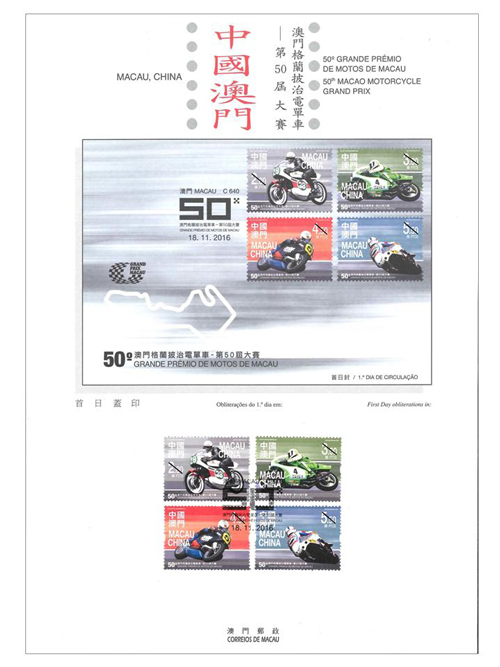 The previous issued stamps are “Lunar Year of the Monkey” on 22/01/2016, the label stamp “Lunar Year of the Monkey” on 22/02/2016, “Scenery of the Imperial Palace in Beijing” on 01/03/2016, “325th Anniversary of the Establishment of the Public Security Police Force” on 14/03/2016, “Chinese Classical Poetry – Ballad of Mulan” on 08/04/2016, “Macao Seen by Chan Chi Vai” on 28/04/2016, “Museums and their Collections V – Maritime Museum” on 18/05/2016, “FIVB Volleyball World Grand PrixTM – Macao 2016” on 17/06/2016, “Mountains and Rivers of the Motherland – Yangtze River” on 11/07/2016, “Games 2016” on 29/07/2016, “Paintings of Macao’s Famous Artists” on 25/08/2016, and “120th Anniversary of the Birth of General Ye Ting” on 10/09/2016, “Chinese Landscape Painting” on 09/10/2016, and “150th Anniversary of the Birth of Dr. Sun Yat Sen” on 12/11/2016. 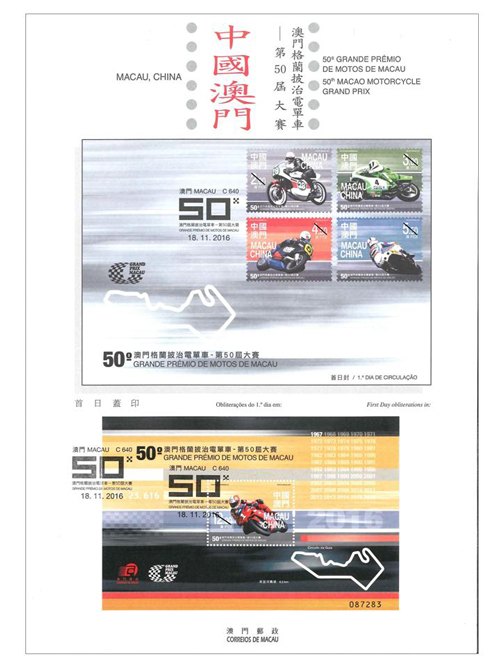 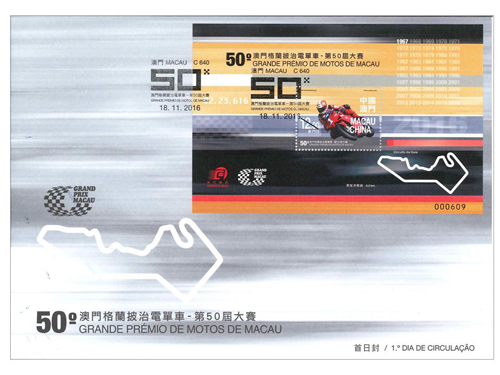 Technical Data of Stamp "50th MACAO MOTORCYCLE GRAND PRIX"